A dominant design feature of the expansion is the cube, the icon of the new Walker Art Center. This shimmering, southernmost anchor to the expansion will house a new restaurant, shop, rental event space--and the McGuire Theater, a 385-seat, technologically sophisticated, on-site performance studio. The William and Nadine McGuire Theater will be equipped with the size stage and technological capacity normally found in a 1,000-seat performance space. 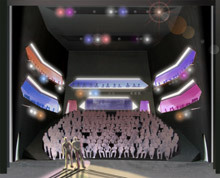 The unusual design will enable performers to present ambitious and technically complex works in an intimate setting. The theater will also serve as a "research and development" space for new pieces, expanding the Walker's ability to commission works, support the development of groundbreaking performances, and foster mutual inspiration between film/video, new media, visual, and performing artists. The Walker's new performance space will be unlike any other in the nation and provide visitors with daily access to the artist's creative process. The public, for example, will be able to watch new dance and musical programs in rehearsal during the day as well as formal evening performances. Unlike most theaters, music halls, and dance facilities in the world that are closed to the public until evening, the McGuire Theater will be a hub of activity, attracting visitors to watch a dancer such as Baryshnikov rehearse. They also will be able to take master classes from visiting performers and step into the creative process by participating in workshops with artists. The theater will provide an ideal venue for artist-in-residence activities, allowing world-renowned artists to speak directly to thousands of school groups and adults annually about their work and their own creative agendas.